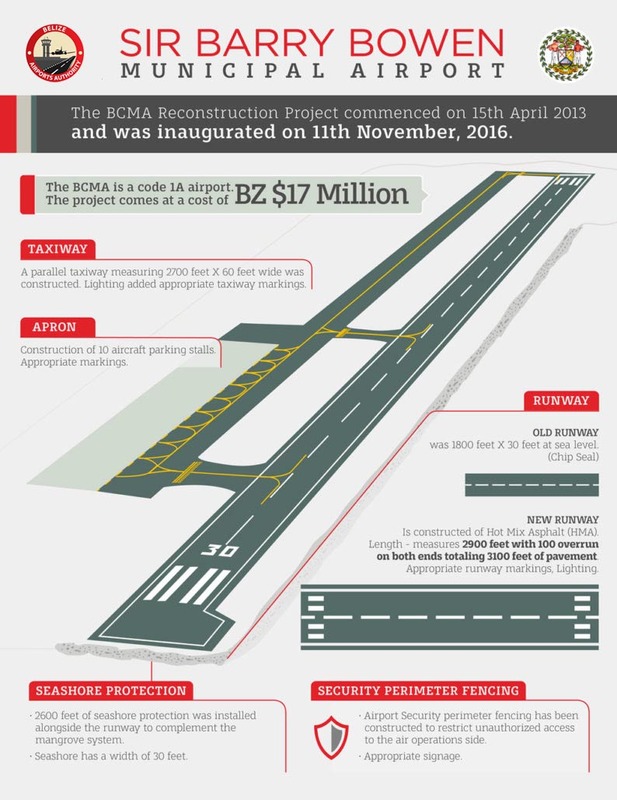 The BCMA Reconstruction Project commenced on 15th April 2013 and was inaugurated on 11 November, 2016. The BCMA is a code 1A airport. The project comes at a cost of BZ $17,000,000.00. New Runway – Is constructed of Hot Mix Asphalt (HMA). Length – measures 2900 feet with 100 overrun on both ends totalling 3100 feet of pavement. Major land reclamation was required. Width – measuring 60 feet with additional shoulder pavement of 10 feet on both side for a total 80 feet of pavement. New runway lighting system has been installed. Runway is now approximately 2 feet above the old runway. All appropriate runway marking in compliant with (BCAR) Belize Civil Aviation Regulations and (ICAO) International Civil Aviation Organization were installed. Markings include- runway edge, centreline, orientation number and threshold markings. A parallel taxiway measuring 2700 feet X 60 feet wide was constructed. Taxiway lights has been installed. All appropriate taxiway marking in compliant with (BCAR) Belize Civil Aviation Regulations and (ICAO) International Civil Aviation Organization will be installed. Markings include- centreline, runway hold position. Construction of 10 aircraft parking stalls. Markings include – apron safety line, aircraft parking stall markings and service road markings. The access road that runs between Marion Jones Stadium and SJC has been constructed to service the SBBMA. Road works will be completed from the Marine Parade near (Marion Jones Sporting Complex) to its junction with St Matthew St.
Drainage system of the entire airport including box drains, culverts along the apron with major outlets to the sea has been completed. Drainage system was constructed alongside the street which including a pedestrian walkway. New road markings will be installed with appropriate signage. 2600 feet of seashore protection was installed alongside the runway to complement the mangrove system. Seashore has a width of 30 feet. Airport Security perimeter fencing has been constructed to restrict unauthorized access to the air operations side. Appropriate signage will be installed. Parking lot has been constructed to accommodate 153 vehicles. Security booth along with perimeter fencing has been constructed. Security lighting and appropriate surveillance system will be installed. New job creation/ employment opportunities. World class infrastructure to increase tourism. Concessional areas for economic development.